The rocks. 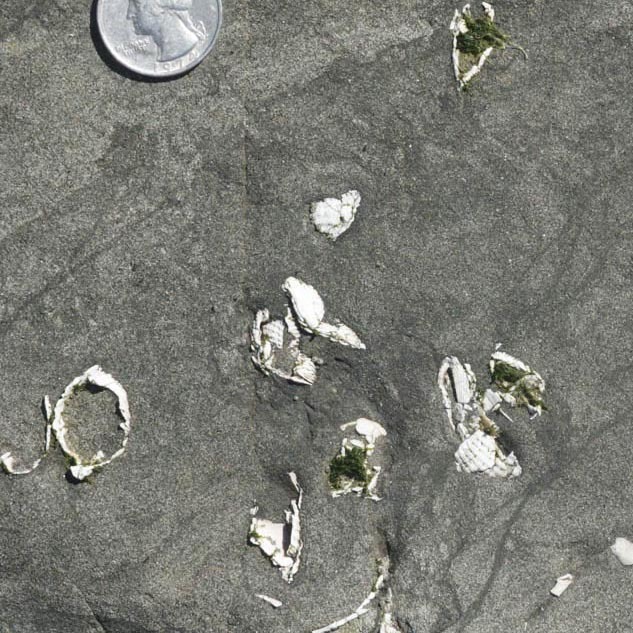 They’re mostly shallow marine sandstones of the Astoria Formation, deposited in the early part of the Miocene, between about 16.5 to 22 million years ago. The rocks are tilted so you can walk horizontally into younger ones, which tend to be finer grained and more thinly bedded than the rocks below. This change in grain size suggests a gradual deepening of the water level through time. In many places, you can find small deposits of broken clam shells, likely stirred up and scattered during storms –and on the southern edge of the first headland north of the Punchbowl, you can find some spectacular soft-sediment deformation, probably brought on by submarine slumping. Later rock alteration from circulating hot groundwater caused iron sulfide minerals to crystallize within some of the sandstone. Soft-sediment deformation in the Astoria Fm expressed as folded beds between unfolded ones. There’s also basalt –of the Columbia River Basalt Group –which originated more than 300 miles away in eastern Oregon. As if that weren’t unusual enough, these basalts intrude the sedimentary rocks! On reaching the coast, the basaltic lavas were somehow able to inject downward into the Astoria Formation to form dikes and sills. You can see a dike and sill next to the waterfall around the first headland, as well as some car-sized blocks of basaltic breccia. The breccias likely formed during explosions as the hot lava interacted with the wet sediment. They’re called “peperites”. At low tide, you can look southward from Cape Foulweather to see two long arcuate dikes that extend offshore from the beach. 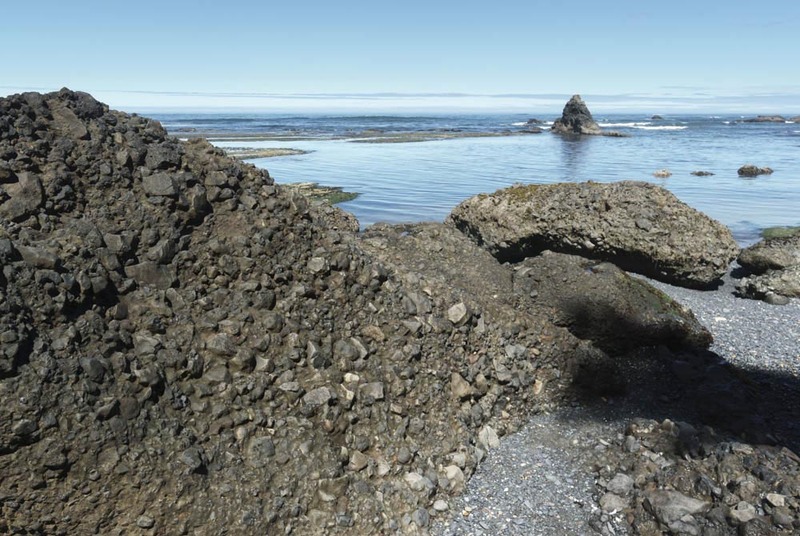 The youngest “rock” isn’t a rock at all –it’s coastal sand and gravel. 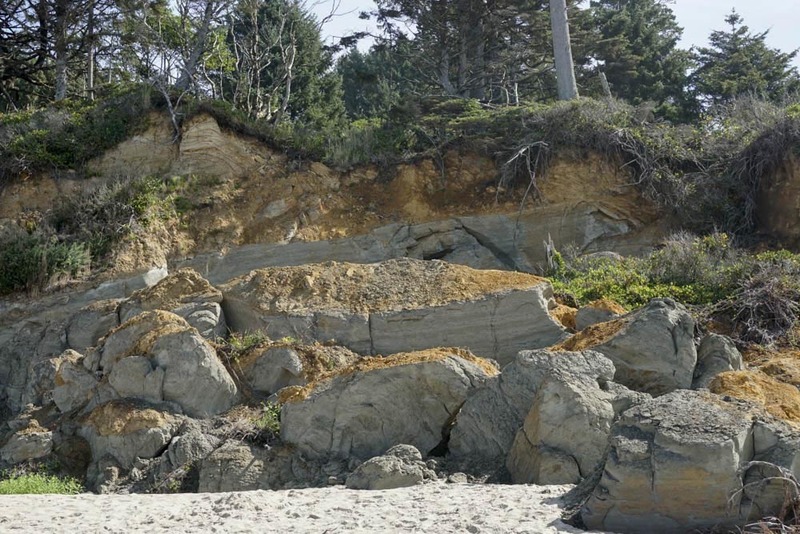 You see modern-day sediment on the beach and older, Pleistocene-age sediment capping the Astoria Formation beneath the marine terrace, about 60 feet above. The surface between the Pleistocene sediment and the Astoria Formation makes for a beautiful angular unconformity where the tilting and erosion of the Astoria Formation had to occur before the flat-lying sediment was deposited. I really love unconformities, by the way –if you want to read more, I blogged about unconformities in the Grand Canyon –and have tons of photos of unconformities as well! Uplift. 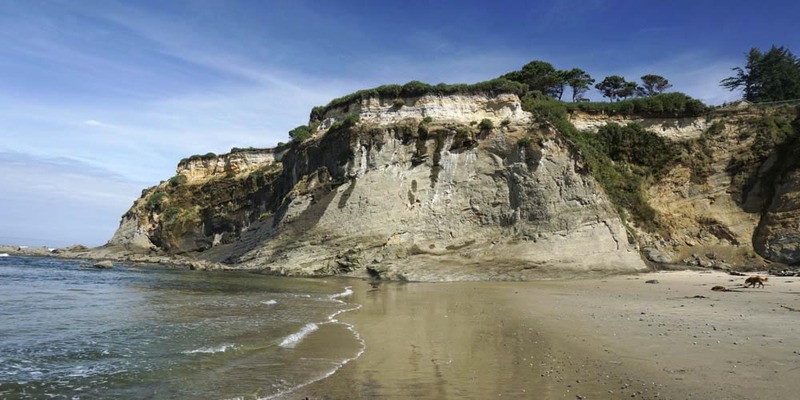 That uplifted marine terrace gives the most direct evidence for uplift along the coast because like today’s beach, the Pleistocene sediment was also deposited at sea level. Moreover, the terrace’s deposits are only about 80,000 years old so it speaks to very recent uplift. Expressions of older periods of uplift are the tilted sandstone beds themselves, having originated as a series of horizontal sheets of sediment below sea level and a number of faults visible in the cliffs that offset these beds. These faults are called normal faults because the block beneath the fault, called the footwall, moved up relative to the block above the fault called the hanging wall. 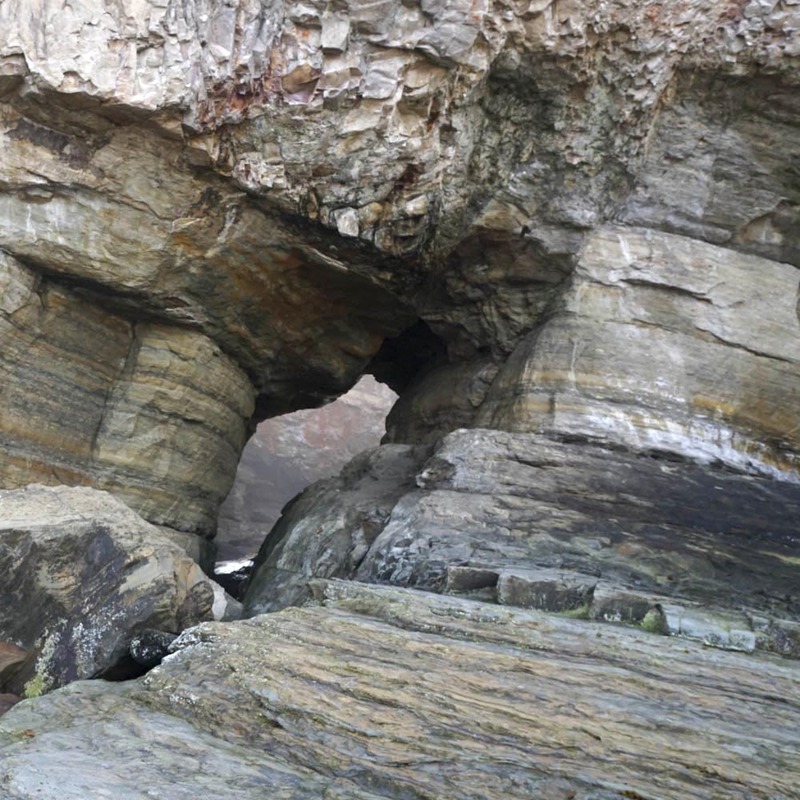 As breakage along faults naturally enhances weathering and erosion, you can sometimes find small caves along them, a good example being near the Punchbowl arch. Erosion. Naturally paired with uplift, erosion shapes the land surface. In coastal environments, wave action and gravity– by rockfall and landsliding– do most of the work. At headlands, waves eat away at the bases of cliffs to undercut and destabilize the rocks above. Naturally, some parts of a retreating headland are left behind, sometimes still connected to the headland by an arch. 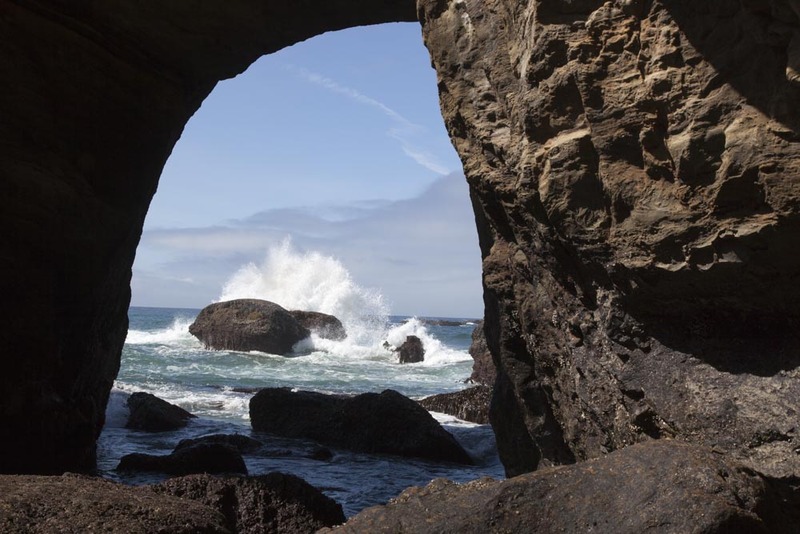 Once the arch fails, the remaining rock is left as a sea stack, itself to be gradually consumed by the waves. At Devil’s Punchbowl, a sea stack marking the edge of the former coastline sits a quarter mile out from shore. Another one stands right on the beach. 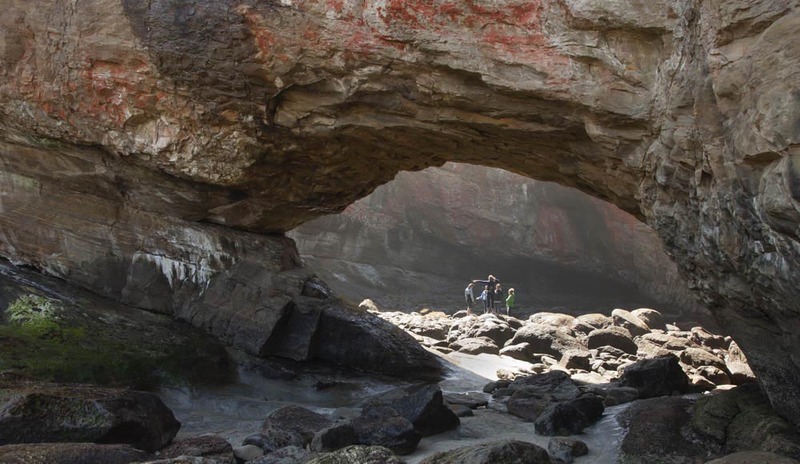 The Punchbowl itself formed from a collapsed sea cave and now offers views through two arches, one directly out to sea while the other looks northward up the beach. You can explore the Punchbowl at low tide. Landslides actively move coastal material downwards towards the beach. You can see several slides at Devil’s Punchbowl, one of which lies along the main trail to the beach. Look for a hummocky landscape as you walk down the trail. The area around Devil’s Punchbowl is especially prone to landsliding because the sedimentary bedding slopes towards the ocean, providing natural surfaces for sliding. If you visit this amazing beach at low tide, you can actually enter the Punchbowl –be careful though, it’s very slippery, and if the tide comes in, you’ll be in real trouble. You can also walk around the first headland to the north to visit the peperites, and check out the many tidepools along the way. Even when the tide’s in, you can see the Astoria Formation, the landslides, some of the faults, fossils, and the uplifted terrace. You can also view the waves crashing in the Punchbowl from above. And up there, you can see a beautiful coastal soil profile. Oh how I love this place! View into the Punchbowl, a collapsed sea cave. Note the inclined bedding. For more photos of the Oregon Coast, check out my website geologypics.com and type “Oregon Coast” into the search. What a wonderful description of this area. I’ve shared this with GSOC, and I’m inspired to make a special trip in the next few weeks to see all this geology for myself. Thanks, Marli! 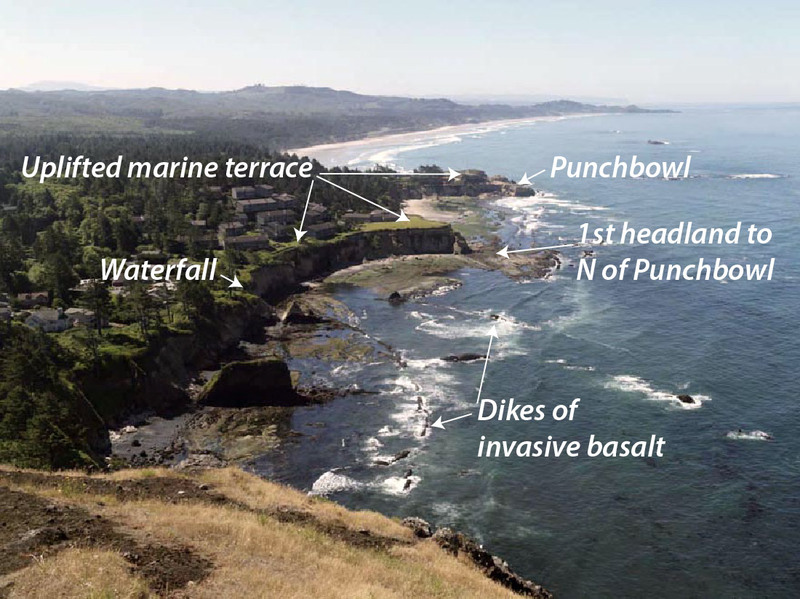 Do you think the bare top of the tilted Astoria at the punch bowl was swept by past tsunamis?? It has little or no vegetation. And it’s at about the right height for the largest tsunamis, no? What an interesting thought Paul -thanks! Maybe we can convince Jody to come have a look!